So yes, we started an independent record label, TrueHorror Music is now a reality. Our first release “As Days Go By” by La Garçonne is not what one would call “horror music” so we have often been asked “What does any of this have to do with horror?” Which is a reasonable question, but beyond the fact that the label, which is an extension of our site, was never intended to strictly be “horror themed” music, that doesn’t mean our first release doesn’t have it’s own ties to the horror genre. It was while watching the horror film Starry Eyes that her music first caught my ear, afterwards being the music lover I am, I did some research which eventually led me to contacting her and listening to more music which had a wonderful new wave, night time listening vibe that I love, it was after listening to it over and over again that the decision to launch this label was made, with the intent that the music of La Garçonne aka Ranya Dube, would be our first release. Which as it all turned out was the perfect project and the perfect person to deal with in our first venture. I have had alot of fun getting to know her while we put this project together and wanted to ask her a few questions so that you the potential listeners could get a better feel for just who it is putting together this amazing music that inspired us to take a chance. One concern I had when approaching her about this project was the fact that while her music had just been featured on the soundtrack to an acclaimed horror film, I wondered how she would feel about having all her music be associated with a horror based website/company. As it turns she out was more than okay with it. TH: Being a horror website and a record label titled “TrueHorror Music” what made you comfortable about being involved with us as your music isn’t necessarily horror themed music? LG: As a kid, horror movies were all I watched! I still remember going to the video store with my older cousin Shelly, they had a massive horror section and we would rent 3 or 4 films every weekend until we made our way through every VHS box on those shelves. I am so inspired by the 80’s, and our generation watched those films all when they were brand new and at some point in time everyone was scared of Freddy, Jason or Michael. These days when you see photos of them or the cover art for those old VHS tapes, it helps place you at that point in time to when the horror genre was so huge and every new film was like an event. Obviously horror is still huge, but I will always have a great deal of love for those older films and how they scared me. To this day those are still the ones that scare me the most. 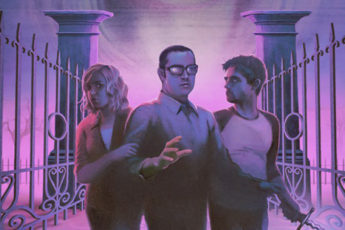 So your site being based on horror was cool with me since I am a horror fan and have so many fond memories involving the genre. It didn’t feel odd to me at all moreso like a good fit! TH: Being that you are a big horror fan what are some of your favorite horror films? LG: All of the Halloween films, Friday the 13th specifically 6, 7 & 8, Pet Sematary, Cujo, A Nightmare on Elm Street especially 3 & 4. I also love American Werewolf in London andthe original Piranha. I could go on and on as we literally would watch whatever we could get our hands on, but those I named would be the ones I love most. TH: We will get back to the horror stuff momentarily as I obviously find it interesting and I know our readers will as well, but can you tell us some more about your music background? What are some of your earliest memories of getting into music? LG: When I was about 3 years old, my dad gave me a huge bag full of 45’s and I am pretty certain that is when my obsession began. I remember in my early years listening to KISS and ABBA religiously until my grandparents got Heart of Glass by Blondie on vinyl. It immediately became my favorite song and the rest is history. I would say though the album I listened to the most in my life is Appetite For Destruction by Guns n Roses. I always wanted to be a Black Sabbath type band but when I was living in England everyone loved Oasis so I just ended up making synth music instead. I love synth music too but I always thought I would be comfortable on stage rocking out. TH: The songs on “As Days Go By” have a very 80’s new wave electro feel, can you tell us a bit about what led you to the creation of the music found on the album? LG: A long time ago I tried to figure out what music meant to me and what I needed it to be in my life. I knew I needed to be making music so I played in bands that werent doing what I wanted to be doing until one day, I met my friend Paul. He was the first person I played with where what we made sounded good to me. I started my first band Villa Cola with him and he taught me alot about engineering and how to record things. We tried to play live but we weren’t very good because we were both very shy and as it turned out didn’t like people watching us. Our band eventually fell apart becayse we realized we were making music for all the wrong reasons and it left me in a really weird place. Since I was a bit down at that point. I just started playing music for the sake of playing music. I didn’t go out much and just lived in a bubble where I would just sit with headphones for hours at a time, writing tons of songs, some I actually finished and these are the ones which are being released on the album. TH: The album has a very 80’s new wave feel, could you explain why you went that route when creating it all? LG: It mostly sounds 80’s because of what I had access to while making it. To make guitar music you need pedals and all sorts of expensive equipment. It sounds 80’s but when I start a song I just start it with a beat or a melody and just add on from there. Since I use a computer, it really dictates my sound so it’s not always planned the way it eventually turns out, for me it is definitely a bit of a spontaneous process when it comes to creating the actual song. I if I had more equipment I could probably hone my sound to be more specific to how I initially hear it in my head, but it never turns out that way, though I think that describes alot of creative mediums really. As far as the 80’s sound goes, when I write, I go through all the snyth sounds and then layer them until I get the feeling that I am looking for so that I can sing over it. I also love reverb which gives it the more lo-fi feeling. I have always said I am not the biggest fan of modern production so with what I have done, it’s just turned out sounding 80’s due to my methods and tools. TH: Having discussed this with you before, while it’s clear you are obviously very passionate about music and have a knack for it, you are also very much into video and film now, how did that come about and what are you working on now? 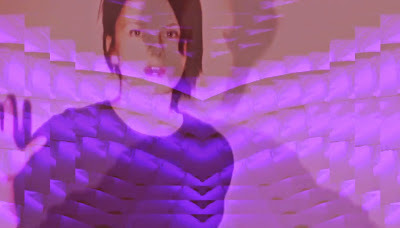 LG: A while back I made a few music videos with my friend Emily for my first band, then I decided to edit a short film for a friend which showed me the other side of editing which to me is the hardest part of making a film. Over the next couple of years I worked as a DP, producer, camera assistant/focus puller and did more editing. I also made some music videos for myself with my other friend Stella, most so I could learn more technical things like using a green screen and advanced editing techniques. Finally I worked on my first feature and that was when I realized that I actually dont want to work on other people’s stories which was a good feeling in a sense that I had always aksed myself what I wanted to do with my life and that really helped me figure that out. TH: Getting back to the horror side of things, what are your thoughts between music and film, especially in horror films? LG: Music for me will make or break a film. I’m pretty extreme when it comes to this stuff though because if I don’t like the music they’ve chosen for a film, I will stop watching something immediately but when music is used properly, it will elevate a film to the next level. It really dictates how we feel when we are watching something. Horror films are scary in a lot of ways because of the music. If you watch it on mute, it will more than likely not be anywhere near as scary or effective. TH: What would you say is your favorite music from a horror film? LG: Well to me it’s more of a sound effect but the signature percussive sound and breathing effect in the Friday the 13th films (ki ki ki or kill kill kill ha ha ha) As soon as your hear it, you know Jason is coming and it’s going to be disasterous when he shows up. We used to play the Nintendo Friday the 13th video game all the time as kids and I love the music on there as well! TH: Your music has been featured in horror films, most recently Starry Eyes, how did you feel about this and why do you feel that your music fits in the horror genre in some way. The Demolisher , it’s director Gabriel Carrer put me in touch with the producer of Starry Eyes so I owe alot ot him as well. TH: While you are focused on the other side of the lens now, would you ever consider filming or scoring your own horror film? LG: Absolutely! scoring one would be pretty cool for sure. If I made my own horror film it would be more psychological like a Starry Eyes as opposed to a slasher. David Fincher is one of my biggest influences so something like “Seven” would be more my style. Perhaps it’s not exactly horror but it would have that grim vibe that I find frightening. TH: We know now you are all about the classic horror films we all love, but what are some of the newer horror films you have enjoyed? LG: I don’t know if I would classify these as pure horror but I am a big fan of Guillermo Del Toro and his group of director proteges. Stuff like Pan’s Labrynth and The Orphanage creeps me out. On a personal note I thought Starry Eyes was brilliant when you think of how small their budget was and that they were able to make something that was so much better than alot of stuff coming out of Hollywood. Off hand I also really enjoyed Let The Right One In, Drag Me to Hell and The Descent a great deal. TH: So getting back to your music before we close this out, how does it feel to see your music collected in cassette form? LG: It feels actually insane to me that in 2015, this has happened to me. As a kid my cousin and I used to take advantage of a loop hole in the old Colombia House’s “get 12 tapes for a penny” deals. We amassed huge collections of tapes. So my headphones were permanently glued to my ears throughout those years, So this tape means a great deal to me and I hope whoever finds one in their possession gets that same great feeling they used to have when they would listen to a new tape for the first time way back when. 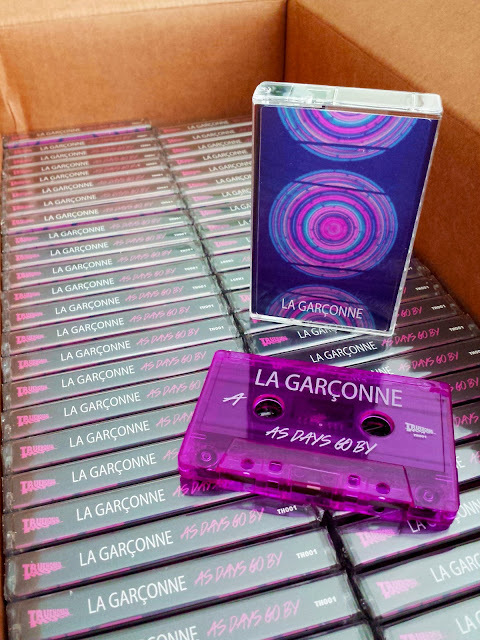 La Garçonne – As Days Go By is now available for pre-order digitally and in limited edition purple cassette. Release Date is May 26th.